Out of nothingness came life. Out of the emptiness and the void, came we. God formed us out of the dust of the ground, breathed into us the breath of life and made us living beings. How great is our God? We mere humans are dust. Yet God loves us so much that he was willing to sacrifice his only son Jesus so that we may live, live free from the penalty of sin, and live forever. How great is our God? From edge to edge of this deep vastness called the universe, God has set the foundations of our firmament. He gave us dominion over all things on the earth. He provided us food with which to feed ourselves, and clothes to keep our fleshly bodies warm. How great is our God? We are but bones, sinews, flesh and skin covering it all. We have seventy years given to us, eighty by reason of strength. Our lives are like a vapor, but even King David asked: Who are we that God should be so mindful of us? How great is our God? Out of the emptiness, God made us, and through Jesus, he fills us with the Holy Spirit and saves us. God is great. Our nature dictates that we ought to hold a grudge against anyone who would slight us. Should we find ourselves angry with someone, our nature would want us to take it further. It is within us not to want to forgive. But God showed us what forgiveness really is. In everything we do, no matter how awful, no matter how horrible, no matter how ugly it is, God will forgive us, if we wholeheartedly repent of our sins. It is within His nature to want to forgive. How much more would His sacrifice mean to us if we had seen with our own eyes Jesus bound, whipped, tortured and nailed to the cross, if we knew that cross was meant for us? In the same way, we have to let go of grudges, slights and anger. Instead, we have to love those who cause us hurt. Bless those who want us harm. Forgive those who wish to do us evil. And even if others did not mean to offend us in any way, but in our old nature, we might want to do them evil, we must allow the Holy Spirit to lead us to change. 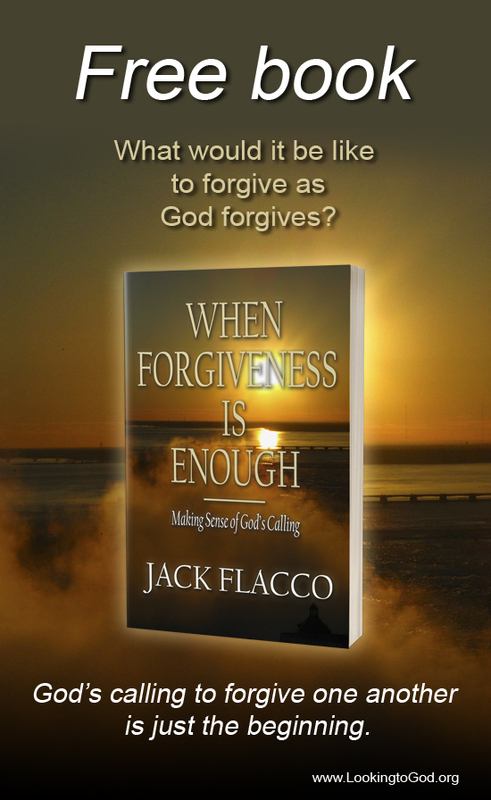 Our nature will then be as God’s nature; and through this, we will have the power to forgive as God forgives. Of all the promises given, the one most important is the gift of the Holy Spirit (John 14:15-17). If we love Jesus our Savior, keeping His commandments, giving God the glory in all things, He will impart the Holy Spirit to us and He will dwell in us forever. We will know God and He will know us. Our sins will be no more, and even when our flesh ceases to exist, we will live again. We will put on a new body, without defect, and it will be perfect in every way. We will be perfect in every way. It all starts with believing Jesus is the Christ, who died for us on the cross. When we accept Him as our personal savior, God promises we will rise again to new life, filled with glory, honor, and joy, brimful and running over. Now is the time to believe. Now is the time to claim those promises. My family’s life is slowly getting back to a semblance of normalcy. We are learning more and more about autism, and learning more and more about our son each day. We have a predictable schedule set for him, a list of daily activities to go through with him, and lots and lots of prayer to carry us well into the week. Had it not been for all the prayer, I do not believe we could have had the miraculous turnaround that took place last month with him. Because, really, it was a miracle he woke up as he did from autistic shutdown. This weekend was a breakthrough weekend for him. Finally, after months of growth, I was able to cut his hair and trim his beard. I say breakthrough, since after we had come back from Niagara Falls in October, he had not wanted anyone to touch him. Now, he is allowing hugs, kisses and me cutting his hair, which is a big deal for our family. Again, much of the successes we are currently experiencing with our son are all due to prayer. I cannot see it being anything else. Naturally, patience and a lot of determination have made a difference with Luana and me. But, I would say, prayer is the key for us here. “Again, for the second time, he went away and prayed, ‘My Father, if this cannot pass unless I drink it, your will be done’” (Mat. 26: 42 ESV). Sometimes there is no other solution than to rely on God, petitioning him in fervent prayer, not only us, but others on our behalf. He does listen. I can attest to that. Otherwise, we would not be seeing the progress with my son that we are seeing with him now. My son dresses himself, washes his face, eliminates regularly again, speaks, answers questions and sits out in the backyard. He has come a long way from not speaking and only staring for the better part of the day. All of it I attribute to prayer. Therefore, if you feel there is nowhere to turn, turn to God in prayer. He will answer. My son is a living example of answered prayer.